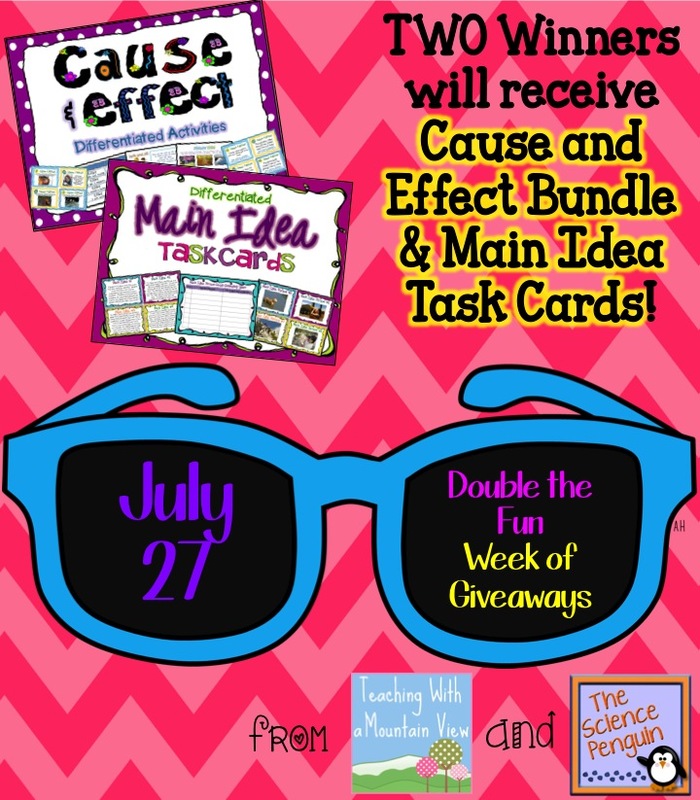 Teaching With a Mountain View: Double The Fun Giveaway Day #2! 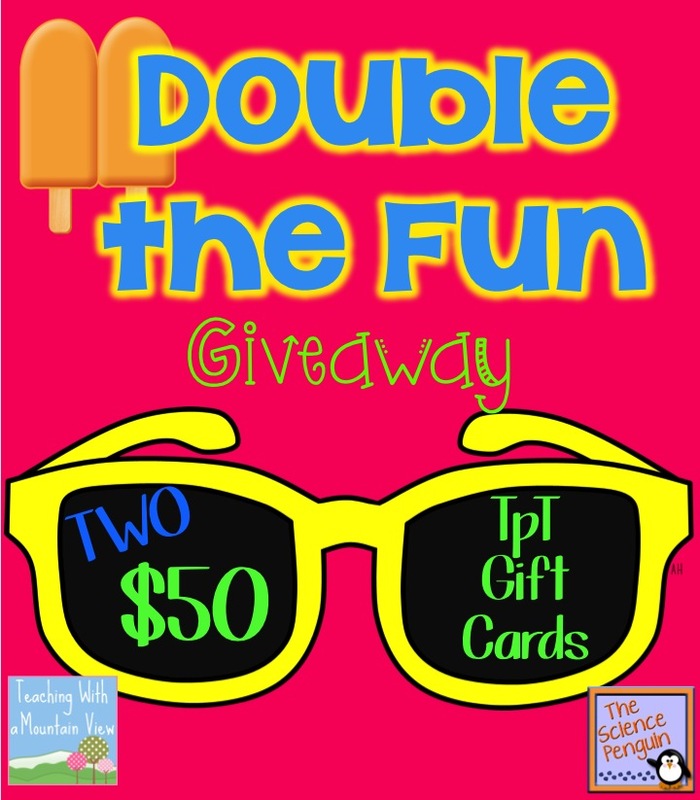 Double The Fun Giveaway Day #2! Welcome to Day #2 of our giveaway! We are so thrilled with the excitement around it, and we hope that you are all excited, too. If you haven't already signed up for the 2 $50 TpT Gift Certificates, go back to THIS post and enter to win! Then, come back here for a chance to win today's product giveaway. CONGRATS to Margarat and Cammie for winning yesterday's giveaway. Your prizes should be in your inbox already! If you teach multiplication, check out the comments in yesterday's post. There are a lot of great multiplication tips! Don't forget to stop by The Science Penguin to see what awesome products she is giving away today! When I introduce cause and effect I always start by walking with my shoes untied and pretend to fall. We talk about what happened and why it happened! I love using the book Fortunately, Unfortunately when introducing cause and effect. My favorite cause and effect activity is making a web with the cause or effect in the middle. Students web their ideas for effects for the cause or causes for the effects. I like to use the "If You Give A ..." books by Laura Numeroff. When I teach cause and effect, I compare it to a chain reaction with an accident on the freeway. They seem to really understand how one thing can cause many other things to happen. I also like to use the book Fortunately, Unfortunately. I like using the 4 pictures 1 word for Main Idea. Each picture can mean one thing when separated but when they are put all together the all tie into on Main topic or Idea. It is also a great tool to use when developing vocabulary. Cause and effect can be a toughie! Looking forward to using these sets this year. I teach cause and effect at time within science - what effect happens when we change something. I use graphic organizers to teach both. I like to teach cause and effect with the book "Cloudy with a chance of meatballs". So fun for the kids. I like to read "Bad Case of Stripes"
I like to use Role Play for Cause and Effect. I have a stack of cards with scenarios on them and the students have to act them out. I like to use graphic organizers and picture books to teach cause and effect. I like to use real-life scenarios to teach cause and effect. I like to use classroom rules at the beginning of the year to teach cause and effect. "In a proper operation, the player turns the crank, which rotates a vertical gear, connected to a horizontal gear. As that gear turns, it pushes an elastic-loaded lever until it snaps back in place, hitting a swinging boot. This causes the boot to kick over a bucket, sending a marble down a zig-zagging incline (the "rickety stairs") which feeds into a chute. This leads the marble to hit a vertical pole, at the top of which is an open hand, palm-up, which is supporting a larger ball (changed later on to a marble just like the starter one). The movement of the pole knocks the ball free to fall through a hole in its platform into a bathtub, and then through a hole in the tub onto one end of a seesaw. This launches a diver on the other end into a tub which is on the same base as the barbed pole supporting the mouse cage. The movement of the tub shakes the cage free from the top of the pole and allows it to fall." For main idea, I like to have students look to see which word/phrase is repeated most in the text - that's the topic. Then think, what is the author saying about the topic? That's the main idea. Then we can go into the text to find details to support it. Students are very familiar with cause and effect by 4th grade so it's easy to review by giving students an action (didn't bring in homework) and asking them to come up with a cause (why?) or an effect (what happens?). Making it real life definitely helps too! Teaching main idea is a core skills in the language curriculum. I find that teaching students about the GIST of the story helps them find the main idea. It is the core or heart of the piece they have read, the takeaway. I use graphic organizers to teach cause and effect. I also teach the language of cause and effect, like therefore, as a result, so. I like using pictures to get my students started thinking about cause and effect. It is also really helpful in main idea because it helps them weed out all the details and "see" what the reason behind the picture is! I love to use Fortunately by Remy Charlip. In addition to the examples of cause and effect it invites readers to find, it screams for students to use it as a mentor text for writing. For cause and effect, I like to use if you give a mouse a cookie and the student create cause and effect puzzles. I like to read Happy Birthday, Dr. King! to teach cause and effect. The kids can make connections with the main character in the story. I like to make cause and effect T-charts with my students. They make it easy to see if you have the "what happened" and "why did it happen" correct. When introducing cause and effect I bring in comics without words. We talk about what is happening in one frame only. Then what will be the effect of what is happening and what the next frame be. I love to have my students role play cause and effect situations. We draw topics out of a bag and then they come up with the skit to demonstrate. It is too, too funny but they get it! I like to use If you give a Mouse a Cookie for cause and effect. These would be great for literacy centers! When teaching Main Idea I always the the 3 question rule. Who/What was it about? What did they do? and Why was it important? If they can answer those questions, they've got it! When I was a reading teacher, I would narrow down our reading to "Who or what?" and the kids would answer, then I'd ask "What did they do? or What about it?" It may seem a bit old-fashioned but I found if I taught the kids to do this periodically throughout their reading, it helped them to focus on main idea. I love using introducing or reviewing either of the topics and then using magazine or newspaper articles with pictures or cartoons in order to have them wonder about what the main idea could be or to figure out the cause and effect of a picture. The kiddos really do enjoy looking like mini adults scanning through a newspaper. We set up different fun scenarios, and I have a couple picture books I use such as "If you give a...". We have fun with teaching cause and effect. 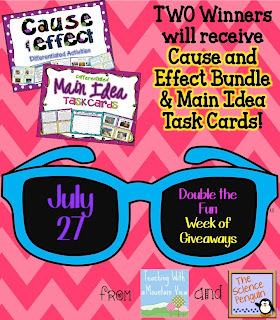 I use the "if you give" series by Laura Numeroff to teach cause and effect.